Mid 13th-century St. Albans is crucially important in the history of English illuminated manuscripts thanks primarily to the works of Matthew Paris, a monk of the abbey. Many manuscripts have been--probably wrongly--attributed to the abbey by comparison with Matthew's style and technique; this psalter is therefore important because its claim to be a St. Albans product (based on the calendar, litany, and early ownership by a St. Albans monk) is secure. Following scenes from the life of Christ, and images of martyrdoms, are scenes with pairs of seated saints. 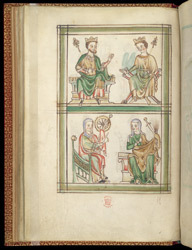 In the upper register of this page are St. Edward the Confessor, whose emblem is the ring he holds, and a youthful king, perhaps Edward. In the lower register are St. Catherine, with her emblems the sword and 'Catherine wheel', and another unidentified saint, holding a sword and scourge, which are doubtless the instruments of her martyrdom.